I make no bones about my support for All for Eve, truly I think it’s a great business idea, and I’ve been proud to be associated with the brand since it’s inception earlier this year. This is just a quick heads up to let you know that All for Eve will be live on QVC tonight at midnight, and they will be the TSV (Today’s Special Value) product of the day too. 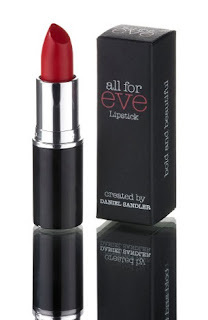 For those who don’t know, All for Eve was set up in November 2009 by George Hammer in memory of his sister in law, Nadia, who died in December 2008 of cervical cancer. All for Eve donates 100% of net profits from all it’s products to the Eve Appeal, which is committed to supporting research into curing gynaecological cancers of all types. This is a business model I can really get behind, and I hope that you will too. So far the range comprises a lipstick (created by Daniel Sandler), a nail polish (created by Sophie Robson), a hand cream, a shower gel, body lotion, body butter and body scrub (created by Urban Retreat) and a nail file (created by Swarovski), I’ve mentioned many of these products before. A new product will be launching on QVC tonight too, as Alpha H are launching a new facial oil, with all profits going to the Eve Appeal. Jam-packed with frankincense, camomile, rosehip, and carrot oils, it’s just what the doctor has ordered for adding to your skin-care routine this winter. I’ve been trialling a bottle of this for the last couple of days, and it’s been perfect for protecting my skin from the dreadful weather, but I’ll give you a more in-depth review once I’ve had a chance to try it out properly. Oh, and as if it wasn’t enough that you can help a deserving charity this Christmas week, if you tune in to QVC this evening – okay, technically tomorrow morning – you’ll be able to see the indefatigable Caroline Hirons (aka known as BeautyMouth to other bloggers, but I mainly call her Hilda – you can find out why if you follow her on Twitter), alongside Tom from Alpha H, and my old mate Daniel Sandler. Show them some support!